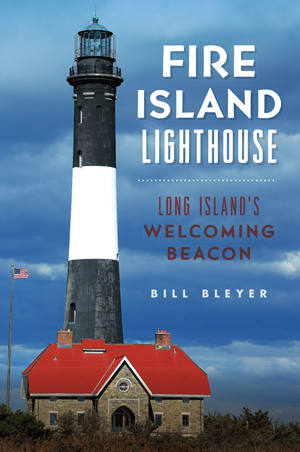 On Monday, August 21, at 7 pm, author Bill Bleyer visits the Oyster Bay Historical Society to discuss his recently released book Fire Island Lighthouse: Long Island's Welcoming Beacon. The event is free and open to the public. Light refreshments will be served. Copies of Mr. Bleyer's book will be available for purchase and signing. For more information, please call 516-922-5032. The first Fire Island lighthouse was constructed in 1826 after numerous shipwrecks along the barrier island. The replacement tower built in 1858 incorporated innovations in design such as the Fresnel lens. Lightships anchored offshore complemented the lighthouse's effectiveness for many years. Then, in 1973 the United States Coast Guard shut the facility down. Through the efforts of the Fire Island Lighthouse Preservation Society and the National Park Service, the light's beautiful structure has now been meticulously rehabilitated and the light relit. For thirty-three years, Bill Bleyer worked as a prize-winning staff writer for Newsday before retiring in 2014. He is the author of Sagamore Hill: Theodore Roosevelt's Summer White House and co-author of Long Island and the Civil War, both published by the History Press.